Statistics Now on site 17 persons. To activare this assets in World Editor, you must select Provider: Sharsh, Product: Addon. 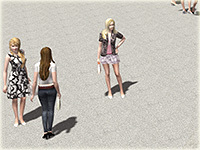 Static characters for a variety on the platforms. It consists of two objects. Girl with flowers and a couple kissing at the meeting.